Entertain your cat with this small and lightweight catnip toy. 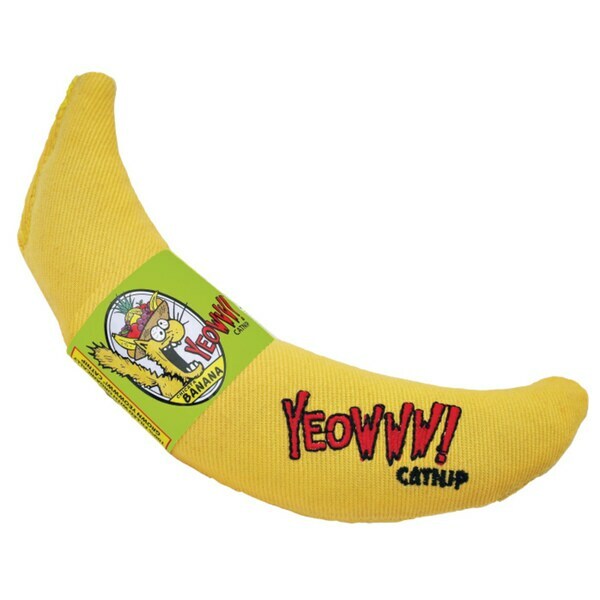 This toy is shaped like a banana for a fun design with a bright, eye-catching yellow color easy for your feline friend to spot and includes catnip for added enjoyment. Yeowww Toys are the Best! Yeowww toys are very popular in my home. I have two cats and they both love these. We have the apple, bananas, balls (that come in 3 pack) and just picked up the candy cane for Xmas. The ones I just got from Overstock are very fresh with a strong catnip smell. They seem to last us longer than other brand catnip toys and are rather sturdy. Yeowww! catnip toys are by far the best cat nip toys I have very purchased. My cats go crazy with them! They can smell them through the packaging and know they are for them. They fling them all over the house! Definitely a great purchase!! As soon as this banana toy came out of the box, one of my cats went wild and declared ownership! The banana scoots easily across my floors and it has seen a lot of play. I highly recommend it for cat parents! classic nanner catnip toy ! Always in demand - felines love these - good price, fast ship, easy ! 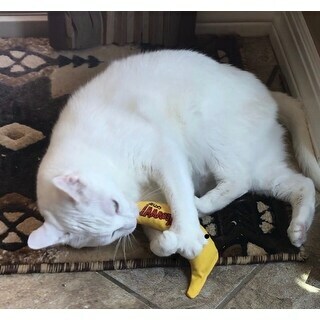 My cat received the catnip banana for Christmas and he loves it! Not sure how long it will last, he has already punctured several holes into it already, but I wouldn't hesitant to purchase another. One cat dug it out from underneath some other toys. All 4 cats love playing with it! My fur babies absolutely love their catnip banana toys! I have bought these for years for them and they never get tired of them! I always buy plenty to have on hand and give them to shelters for their rescued. Our cat loved it the first day. We could smell the catnip through the plastic bag, and I feel that he may have played with it too long. It still has a very strong smell, so he will smell it on occasion, but hasn't played with it since. I'm hoping that once the smell settles some, he will play with it more. My cat loves this! I bought him a different brand when he destroyed the first one but wouldn't touch it. The Yeow! banana is the only choice for my picky cat. My cats loves these' they can smell them thru the package. OUr cat likes to bat this around but must not be as "catnippy" as some of his other toys. Great toy for the fur babies - I brought the package in and the kids opened it right up and began playing with it. My cats love to hold this and do kitty kicks, and chew on it. What is it about cats and bananas. My cat loves these, but ignores all other catnip toys. Weird.